We've strategically chosen to experiment with this diet during the Baha'i Fast. Because the Fast is 19-days long, we decided it would be enough time to get a solid experience on what it's like to transition into and be in ketosis. Ketones are produced faster through fasting (pun intended). Blood sugar stabilizes, allowing me to go through my day with stable energy and focus. As you may have seen if you've been keeping up with my blog, I've experimented with multiple diets. By no means would I consider myself a "chronic dieter" or "yo-yo dieter". The intention behind it is simply to gain experience first-hand so I can attempt to improve the experience of my patients who may end up needing to utilize one of these diets for healing. Some examples includes: the Elimination Diet, Paleo, Vegetarian/Pescatarian, Candida diet, low FODMAPs, Specific Carbohydrate Diet (SCD), and the 21-Day Sugar Detox. For those who are unfamiliar with the ketogenic diet, it is a high-fat, low-carb, moderate protein diet which produces endogenous ketones from the mobilization and breakdown of fatty acids that are used as your body's primary fuel while minimizing the utilization of glucose. One may also enter ketosis by simply fasting for a prolonged duration. If you're interested in giving it a go, I highly recommend using a doctor and a nutritionist who are familiar with the diet to guide you through the process, at least initially. Depending on one's current state of health, the risks may be higher. 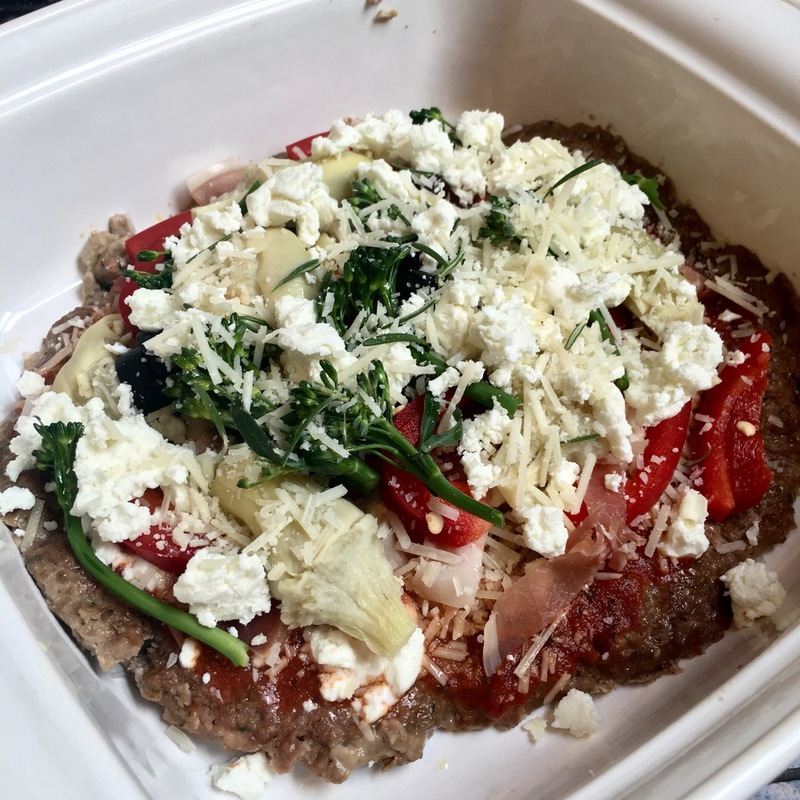 Throughout this challenge, I've had a few encounters with people saying "Oh, I've done a ketogenic diet" when really they're just doing a low-carb diet, they are not the same. One must be in a state of ketosis, producing at least .5 mmol/L of ketones. This can be measured in the blood using a ketometer and ketone test strips which is more accurate than using Ketostix, which only measures urine acetoacetate. Other ways to know if you are in ketosis is having a metallic taste in your mouth and increased thirst. I definitely experienced both of those. Depending on insulin sensitivity, body fat percentage, and multiple other factors, each individual has a different threshold for how many grams of carbohydrate they can have before making the switch back to glucose as the primary fuel. I was able to maintain ketosis at 35 g per day. The transition to ketosis may also vary, usually it takes between 3-1o days. Many people will experience what is referred to as the "keto flu", where they experience flu-like symptoms as their body is trying to figure out how to fuel itself. The symptoms may include fatigue, brain fog, and weakness, among other symptoms. Often times, the symptoms may be directly related to one's health status. Because toxins are stored in our fat, as we begin to mobilize our fat stores for energy, our livers need to process of the stored toxins as well. So, for someone who is very overweight, they may experience more symptoms because their body can be temporarily overloaded with toxins. This is another reason why trying this with physician supervision is highly recommended. Ketosis is NOT the same as ketoacidosis. KetoACIDosis is a potentially deadly event that occurs in type 1 diabetics when ketones exceed a healthy amount because insulin was not present to regulate (insulin is a major regulator of ketone body production). Acetoacetate and beta-hydroxybutyrate are physiologic ketone bodies which have an acidic effect on the blood (hence the "acid" in ketoacidosis). However, if one's pancreas has the ability to produce insulin (which it should as long as you don't have diabetes or another pancreatic condition), then he/she will remain in ketosis and not progress to acidosis. Because I'm very insulin sensitive and don't really have much body fat to lose, I could get away with eating more carbohydrates. I aimed for 35g/day of carbs, which is still not many at all! I barely managed to fit in enough veggies to kill my green tooth. 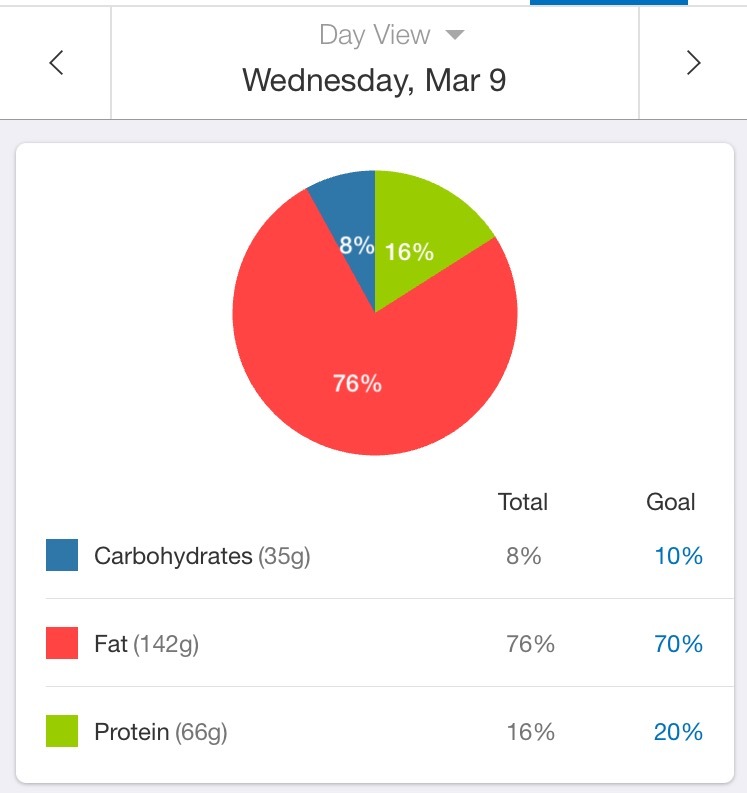 I used the My Fitness Pal app which I recommend if you need to get an idea of how many calories and/or macronutrients you're getting in your diet. I don't like recommending it to be used daily because I don't want it to become an obsessive pattern. 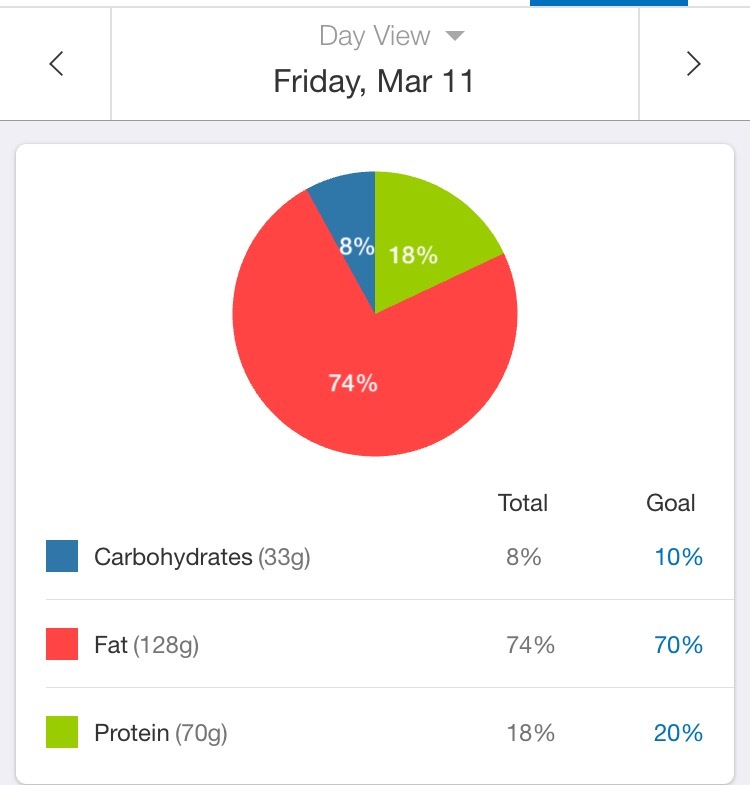 The app has a pretty wide database of foods with accurate "nutrition fact" information which can be helpful for learning how many macros are in your foods. I didn't track my calories every day, mostly just in the beginning and random days throughout just to be sure I'm getting enough calories and staying within my macronutrient ratios. 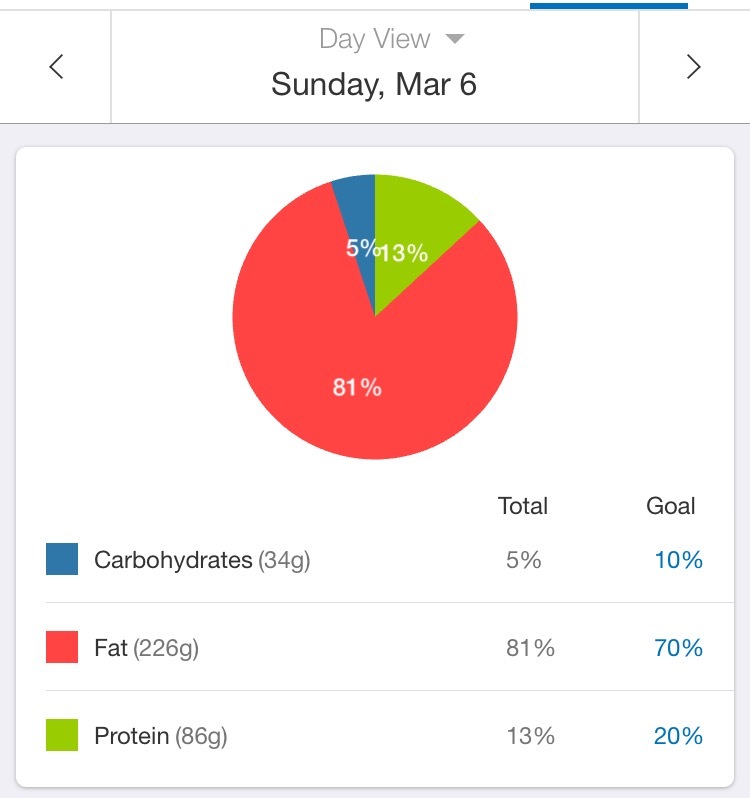 I aimed for 10% carb, 70% fat, and 20% protein, I didn't reach those goals every day (it's just not realistic) but as long as I stayed in ketosis and got enough Calories, I was fine with it. Because I was fasting through the day, I ate only two meals per day and didn't require many snacks. At times when I did need a snack like when I just got off of work, the sun had set, and I still had about an hour before I could eat any food, I would have a Phat Fudge. I highly recommend it for anyone needing stable energy and hunger signals, even if you're not doing a keto diet. I didn't have any goals for what I wanted to accomplish except to experience the diet and it's challenges. However, I did have some predictions of trends I would see based on what typically happens in others. Neither my husband nor I experienced the "keto flu" during our transition phase and both of us were in ketosis on day 3. I normally wouldn't wish for flu-like symptoms, but I was hoping to experience what many people do experience during this transition. For many people the initial fatigue and weakness will eventually subside and be replaced with increased focus, energy, weight loss and improved mood. For us, we also didn't experience that because we are already stable in our mood, energy, focus, and strength. I did expect to see some fat loss but not a lot because I'm already as lean as I should be so a loss of 1.3% was about what I expected. I was surprised that I gained 1.3% lean body mass, especially since I'm still on crutches from my knee injury (I've visibly lost my left quad muscles) and am only able to do very limited single-leg and upper body exercises. Realistically, I've only been doing 25 minutes of bike riding and 15 minutes of exercise about 1-2x/week. See here what the majority of my workouts look like (plus pushups, pull-ups and arm-bike). I'm already at my optimal numbers for weight and BMI so no change was expected and no change occurred. My last blood test was back in August 2015. All my numbers were normal and low-risk in August but I was just curious to see if any change occurred so I retested on day 15 of the challenge. I noticed a slight increase in my HbA1C which is a longer term marker of blood glucose. 15 days in the context of 120 days is not enough to really see significant change, especially for someone who didn't have much room to change. You may be wondering where the 120 days comes from; the lifetime of a red blood cell is 120 days the HbA1C measures how much glucose has stuck to each RBC. Since I already eat fairly low-carb, my HbA1C probably didn't need to change much anyway. Not many people are happy to see their triglycerides go up, but mine were chronically low in the past so I'm very pleased with where they are at now. I'm also very pleased with my omega-6:3 ratio. That points to my anti-inflammatory capacity. Way back when I was vegetarian, I also had chronically low iron stores (as shown by the ferritin marker). It's always nice to see that number go up and I would say it's currently optimal. I normally eat red meat 2-3x/week and doing keto it was more around 3-4x/wk. With the increase in highly bio-available iron in red meat, it would make sense that my stores would slightly increase as well. Many people report increased energy and focus and improved mood and body composition. It is effective in helping people to lean out and maintain lean body mass because it has a protein-sparing effect. Researcher Dominic D'Agostino also reports deadlifting 500 pounds for 10 reps while in ketosis after a 7-day fast! Some research shows low-carbohydrate diets help to reduce blood glucose, hemoglobin A1C and LDL-cholesterol levels (risk markers for diabetes and heart disease). As you can see, I have some pretty severe (for me) acne and dark circles under my eyes. This may not happen to everyone, I just know the reactions I get when I eat dairy. It is also possible to do the diet without dairy, it's just more challenging. Another downside is the most obvious one, the lack of carbs. I found myself craving vegetables and fruits like sweet potatoes, plantains, beets, carrots, dates and apples. Most ketogenic desserts call for the use of alternative sweeteners like erythritol and stevia. They also call for flavorings like "mint flavor" or "raspberry flavor" to make desserts. Though I agree those are some "less bad" sweetener options, I just felt gross after eating those ingredients and it goes against my philosophy of eating real food. Overall, I will say that this is a diet proving to be very effective therapeutically in the research for short durations. However, I wouldn't recommend it for the general person, especially for women hoping to get pregnant (fat on the body is essential!). If you think you could benefit from trying out the ketogenic diet, please schedule and appointment with me and I can help you figure that out. Our experience with the ketogenic diet was rather uneventful because we already ate pretty low-carb anyway, neither of us had much fat to lose, and we are already functioning optimally. However, I now feel better prepared to help others create the foods they need to have a positive experience on the ketogenic diet. To learn more about ketosis, you may be interested in listening to Tim Ferriss's podcast interview with Ketogenic Researcher, Dominic D'Agostino. Other prominent ketogenic diet researchers to keep up with include Thomas Seyfried, Jeff Volek, and Richard Feinman.